A highly colorful pieces that contains five different gemstones, all of which are spectacular quality. The total gemstone weight of this bracelet is approx. 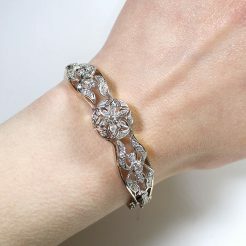 56.00ct with 2.00ct total weight of single cut Diamonds. The stones are set in 14kt White Gold.